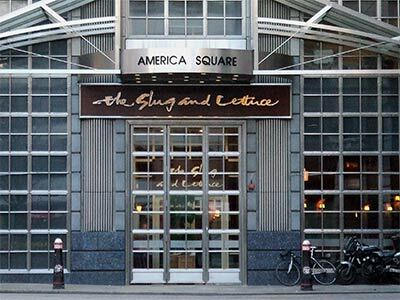 The Hog's Head at America Square is now a Slug and Lettuce, both are brands of the Laurel pub company. I am guessing, but I imagine that the re-brand is aiming to reinvigorate the venue and stimulate trade. I have to confess I rather liked the Hog's Head and I’m pleased to say that the Slug & Lettuce style is not bad either, although I've always had reservations about both the names, at the very best, they are memorable. Over a quater of a milliaon has been spent, bringing a new freshness to the place, but to be honest, those who new the Hog's Head will find the change a subtle one. A large pub, set in the arches of the line to Fenchurch Station, there is huge range of seating in both the main arch and the secondary arch, mostly in this years (2007) colour, brown. This is defiantly a venue to relax and enjoy lunch or a drink in the evening. Prices are as you would expect in the City, London Pride is a little over £3 a pint, food is very good and again about the price reasonable. The staff are excellent, friendly and really happy to serve, which in my view makes all the difference, the Slug is now non-smoking throughout, preempting the government band in July this year.